Stop by and visit our great store - open year 'round! This is our Main Office - Check in here for most lodging rentals. Patoka Station is located just outside the main (Newton-Stewart SRA) entrance to Patoka Lake, on the west side of the road. • All boat rentals are 9 a.m. - 6 p.m. EST daily (excluding houseboats). There are no overnight rentals. Please disregard the departure date on your boat reservation confirmation. • Lightning/Rain Policy: If it is lightning between 9 am & 12 pm on your boat reservation day at Patoka Lake Marina, you will be issued a "Lightning Check". Your credit card will be charged for the full amount and your reservation will be transferred to another date in the current season. Boat rentals will still go out if it is raining. No refunds will be issued if it rains on the day of your reservation. • You do not need a special license to drive our rental boats, just a valid driver’s license. • Alcohol on the water: It is illegal to operate a motorboat or a personal watercraft while intoxicated due to alcohol or any combination of alcohol, controlled substance, or drugs. • Life jackets are provided on your boat rental for anyone 30lbs or more. You will need to bring your own life jacket for anyone under 30 lbs. • State Park passes (to enter the DNR gate) are not available for boat rentals (excluding houseboats). State Park passes are available for overnight lodging/houseboat customers. • ALL DEPOSITS must be made with a debit/credit card. The remaining balance can be paid with a card or cash on or before arrival. Checks are not accepted. • The deposit you put down when making a reservation goes towards your total, it is not a refundable deposit (excluding the security deposit on the PLW Event Center). • Towels and linens are provided in all land-based lodging and floating cabins. • Towels and linens are NOT provided for houseboat rentals. 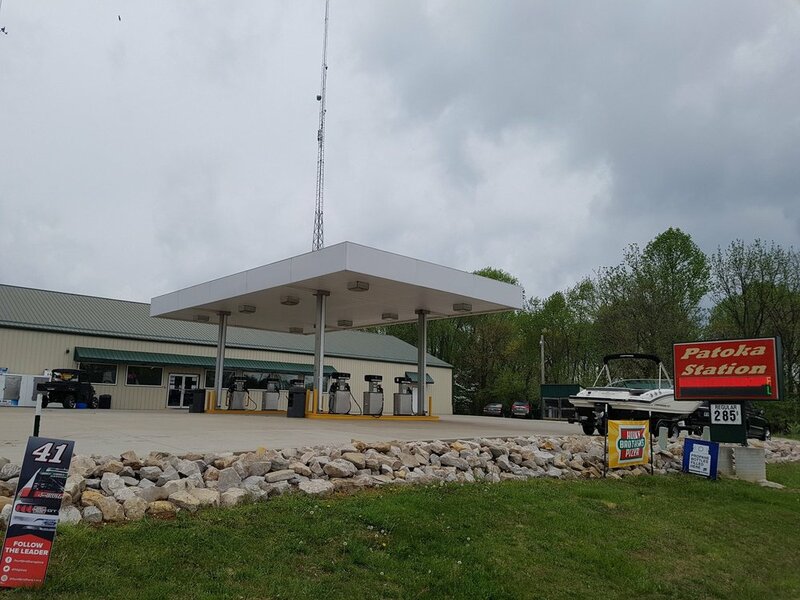 • For your convenience, park passes are available for rent at Patoka Station, Marina, and Winery with a $50 CASH deposit. A park pass will allow ONE vehicle through the entrance to the state recreation area without paying the entrance fee. Once the pass is returned, the $50 deposit will be returned. There is only ONE pass available per unit. • Tent/RV camping is available at Patoka Lake. The DNR Office at 812-685-2464 or the Indiana State Campground Reservation system at 866-622-6746 can provide information for making a campground reservation. We at Patoka Lake Marina can not make reservations for campgrounds. • We do not allow tents to be set up outside if you are staying in one of our units. • All Lodging Units have outside plugs in available to charge your boat batteries, including the Floating Cabins. A gas station, convenience store, main office, and much more! Find all kinds of last minute supplies, including boating, fishing and camping supplies. Snacks, drinks, and much more! Serving sandwiches, burgers, hot dogs, pizzas, chicken strips, ice cream and more! Large selection of beer available. Craft beers plus non-beer alcoholic beverages available. T-shirts, glassware and other souvenirs.